Lila was the first real novel I read this summer. I started it in the weeks just after the last push for exams, when my mind was weary and ready to be swept up into another's world. I was not disappointed. Rarely have I felt myself so immersed in the thought of a character, in many ways thinking along with her, forgetting my own omniscience as a reader. Lila is the companion to the earlier Gilead. That first novel is a book of letters, written by an elderly pastor in small town Iowa to the young son whose adulthood he knows he will not live to see. Lila, mother of that son, glimmers in the background of the book, her presence a grace that still startles the old man to wonder. We know, from the old man's words, that his marriage was startling, if not scandalous to the small town and flock in his keeping. We know that Lila was a drifter, a woman with an unknown past. In Lila the novel, we are taken into Lila's mind, seeing the story, the marriage, the coming child through her own eyes. In a masterful stream of narrative, in which Lila's thoughts leap between memory and present, past event and current meaning we encounter, not just a story, but the shape of a mind that has been molded by loneliness, by suspicion, by a long, hard life on the road. Lila's inner voice is inclined to distrust everyone and yet... she yearns to trust. 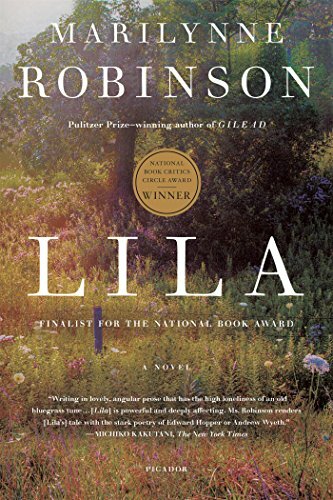 What brings Lila into the story we read is her hunger for love, her fragile hope in the gentle love of a good old man whose faithfulness has challenged the narrative by which she lives. Lila is in many ways the story of two inner voices, that of loneliness, and that of love, and the two as they wrestle for primacy within Lila's heart. Someday I should probably write a longer and more literary review of this remarkable book, but for the moment, I just want to write about those two voices, because what gripped me was how familiar they were. As I read Lila's thoughts, thought them with her really, I was startled by my first inclination to believe Lila's inner narrative precisely because mine is often the same. I know the power of loneliness to tinge any offer of love with doubt, to steal away the innocence of joy, to darken expectation of good. I wonder if most of us do, if we will finally be honest with ourselves. But what challenged Lila's fractured way of seeing was love; in action, in presence, in faithfulness that could not be denied. And it challenged mine, made me again aware of the power of my thoughts to tinge the world around me, the love given to me in husband and family and friends, made me realize that, as a dear mentor has told me many a time "you have to speak to your thoughts, not listen to them!" So as I read, I began to note down characteristics of each voice, interrogating my own inner narrative as I went. First, the voice of loneliness. Loneliness cannot forget the grief of the past. Every time a moment of peace comes to Lila or her heart begins to settle into the gift that is her new home, she gets suspicious. It's too good to be true; and the voice of loneliness tells her she's too smart to believe it. She steels herself for the moment that the Old Man will be angry at her, will send her away. That's one good thing about the way life is, that no one can know you if you don't let them. Loneliness always sets the painful past as a backdrop to the mind so that the heart is tense and defensive. Lila remembers the darkness before and any kindness or good or casual word gets filtered through a screen of sadness. The old man's quiet, stated devotion reaches Lila as a hollow promise, something she expects to fade. She had told herself more than once not to call it loneliness, since it wasn’t any different from one year to the next, it was just how her body felt, like hungry or tired, except it was always there, always the same. Loneliness tells us we are not worth love. Loneliness shows Lila the long line of people who left her, forgot her, rejected her and presents that as defining evidence of her worth as a person. And she believes it. She believes it so strongly that she almost cannot accept the love that comes to challenge the tyrannical finality of loneliness. Loneliness, oddly, seeks isolation. One is safe when one cannot be betrayed. And Lila's impulse is always to leave. It is the secret possibility that makes her feel safe. But what about love, the voice that challenges that of loneliness? In the novel, love finds Lila in the form of the old man whose care both for her soul and her heart are tenacious, long-suffering, and tender. The old man, even amidst his own frailty and need yet embodies that paean of love in 1 Corinthians, rooted as he is in a lifelong journey toward the healing love of God himself. Love draws us into the present. Love draws Lila from the mist of her grief and guilt, summoning her to stand in the presence, not of phantoms, but of a human being whose hands and heart are offered to her. If the Lord is more gracious than any of us can begin to imagine, and I'm sure He is, then your Doll [Lila's sort-of guardian] and a whole lot of people are safe, and warm, and very happy. And probably a little bit surprised. Love sees us in the wholeness we cannot imagine for ourselves. 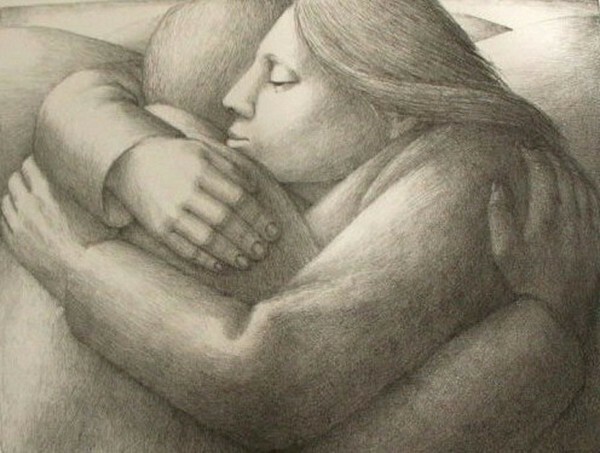 The old man sees the beauty in Lila's loyal, suspicious heart and by his love, he draws her, step by step into health. Day by day, as she dwells within the home that is his gift she begins to belong, begins even to believe she belongs. At first she feels it is play-acting, but love not only brings her home, it makes her at home, makes of her a loved and honored wife and helps her to believe it too. She thought, if we stay here, soon enough it will be you sitting at the table and me, I don't know, cooking something, and the snow flying, and the old man so glad we're here he'll be off in his study praying about it. And geraniums in the window. Red ones. Love never fails. Even in the face of suspicion. The old man's affection remains. He is sometimes grieved, often frustrated as he sees the fear light up in her eyes, the impulse to run straiten her muscles. But his love does not fail and it knows how to wait. When you’re scalded, touch hurts, it makes no difference if it’s kindly meant. There was no way to abandon guilt, no decent way to disown it. All the tangles and knots of bitterness and desperation and fear had to be pitied. No, better, grace had to fall over them. I've been thinking a lot about loneliness lately because I think its endemic to the human condition and I think our sense of isolation is deepened by modern life. One of the things I studied in theology was what it means to be fallen, to sin, to live out the opposite of love. And the opposite isn't hate, as you might instantly think. Rather, if you define love as the perfect and continued gift of self as imaged for us in the Trinity, as incarnated in Christ, if you think of love as fellowship with God and with one's fellow creatures (as I would after many hours of study), then the opposite of Love is a self turned in upon itself, a self isolated and disconnected from other selves, a self profoundly alone. Isolation, disconnection, this is what it means to be fallen, and in a culture that tends toward radical individualism and an online world where we can hide our real, lonely selves behind countless profiles, I think it is easy for us to listen to the voices of loneliness and turn increasingly from the challenge of encountering the real, transformative love of God, or the challenging love of the other people in our lives. Isolation is safety. But it is also a slow, slow death. After reading Lila I was challenged to confront my inner narratives. It's the small things. It's choosing to live in the acceptance of my husband, accepting his loving ease with my foibles when my heart fears rejection. It's choosing to reach out to friends I haven't seen for awhile, to choose connection rather that isolation when I feel forgotten or lonely. It's choosing over and over to recognise and talk down that voice in my head that makes me suspicious of friendship or expectant of rejection or even just tells me to switch on the screens and lull the loneliness. It's choosing, daily, to read my battered old Bible one more time and try to believe the grace I am offered, the hope I have, the love in which I stand. I'm getting there. I hope you are too. May the voice of love break into whatever narrative you and as with Lila, 'may grace fall over' every bit of your heart.